Six inches of snow on New Year’s Eve could not stop seven pairs of determined lads pushing each other in wheel barrows around the North Road in Ponteland. Forget rumours that this is a remnant of an ancient tradition. It is the utterly pointless wacky activity so loved of English people. It is the chance to blow away the excesses of the previous night and arrive totally knackered at the finishing line. The hundred odd spectators had an invigorating walk, greeted many friends and helped local charities with their generous donations. 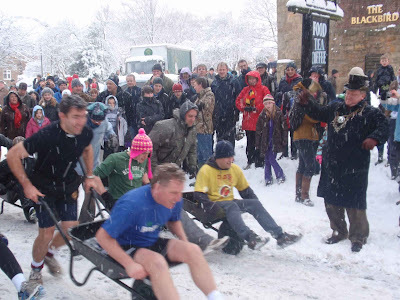 The event started from the Blackbird Inn and this year, to the accompaniment of snow showers, they served up Punch and hog roast in buns. The event was organised by the 41 Club and promoted by Ponteland Rugby Club. And by the way, the winners were Andy Pybus and Alan Redman. Almost boring since they have now won it for three years. Where’s the opposition?